The cut and pocket layout of the Helikon-Tex tactical shorts retains a civilian outlook. The OTP® design allows you to carry all essential equipment, and anatomic cut does not hinder movements. Elastic waistband and Velcro-closure allow a degree of adjustability within size. Large belt loops allow wide belts to be used. The jeans cut on the rear part of the pants prevents them from sliding down. Pocket layout allows distributing the load close to the center mass – around hips and waist. Pocket edges are reinforced to withstand constant sliding of light and knives clips. Two Velcro-closed front pockets are big enough to take a smart phone – or a spare magazine. Zippered thigh pockets seem small enough, but they would carry a wallet or a small pouch. A variety of colors allow you to find the proper one to match working or outdoor conditions or other garments. Disclosure: Military 1st contacted me to try one of their products. 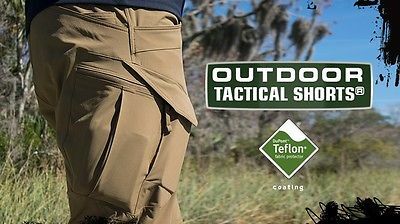 They recommended the Helikon-Tex Outdoor Tactical Shorts with 8.5″ inseam. The shorts were provided at no cost to me. My only responsibility was an agreement to complete this review after trying the item. I was not pressured in any way to make a positive endorsement. These Helikon-Tex shorts are quite comfortable, breathable, and flexible. They are somewhat stretchy, so they move as you do, great for hiking. The belt loops are nice and wide so just about any size belt will fit. I always hate it when my favorite belt is too wide for the loops. There are two things in particular about these shorts that really caught my attention… one positive, and one negative. On the positive side: POCKETS! The pockets on these shorts are incredible. I have always had a thing for pockets when hiking. I like to have small items that I want access to quickly in my pockets rather than in my pack. There are pockets inside of pockets. There are pockets with zippers. There are pockets with velcro. There is not one, but two specially made cell phone pockets that provide a snug, secure fit for your phone. It even has a flap for additional security. There are pocket knife and flashlight pockets. The zippered pockets are ideal for wallet and keys security. The Teflon coated material is even somewhat water resistant offering protection from rain for electronic valuables. The pockets are mesh on the inside affording breathability and comfort. Now the downside. I’m not a fan of the velcro clasp at the waist. Sure it’s great for adjustable fit as your waist grows or shrinks. In combination with elastic in the rear of the waistband, the size adjusts as much as 2-3 inches. But you have to get each side of the velcro aligned just right or your shirt tail tends to get caught in the velcro, and the zipper doesn’t close all the way securely. Just a nit perhaps, but I’m used to snaps, clasps or loops. Wearing a belt helps. Otherwise I really like these shorts and have worn them on every hike since receiving them from Military1st a couple weeks ago. They’re even somewhat fashionable as well. The Helikon-Tex Outdoor Tactical Shorts with 8.5″ inseam comes in three colors: Khaki, shadow grey, and mud brown. I chose the khaki myself. They come in six sizes: from S to 3XL. The medium worked well for me. The shorts have a suggested retail price of US$58.90. You can purchase a pair from Military 1st at their website. Check for availability before ordering. Disclosure: Military 1st contacted me to try one of their products. They recommended the Helikon Outdoor Tactical Shorts with 8.5″ inseam. The shorts were provided at no cost to me. My only responsibility was an agreement to complete this review after trying the item. I was not pressured in any way to make a positive endorsement.